I’m kind of sad that Sew Grateful Week is over! It’s such a fun week! I really enjoyed everyone’s posts and thoughts on gratitude. 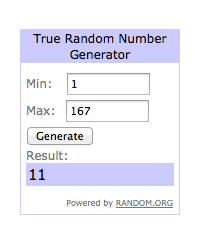 But before I leave it behind, there’s one more thing to take care of… announcing the winner of my Coco giveaway! 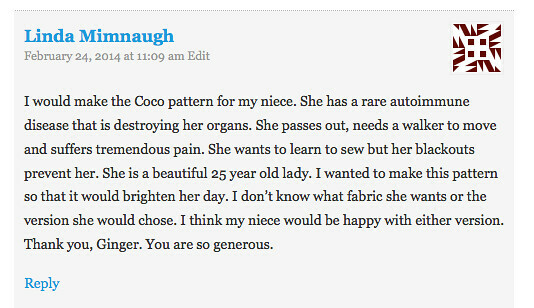 I’m so sorry to read about Linda’s niece’s illness, but I’m really touched by her generosity and I hope that a new dress cheers her up a bit. I hope that you guys can keep her in your thoughts and prayers. this is all kinds of sobering awesome… but still, awesome. What an awful tragedy but what a wonderful aunt she is. What may deepen or lighten such an horrible situation is the people surrounding the niece and her family and the efforts that others make.